There are three stages or phases to the disruption occurring within retail financial services. Each stage is disruptive enough to be a ‘game changer’. However, by the time the third phase impacts retail banking around 2015 (or perhaps earlier) the changes will be complete and irreversible. Embedded into this initial phase of disruption was also the emergence of social media and collective curation. As users started to participate in social networks, customers realized that these platforms had huge potential for empowering groups with common interests, or causes. No longer were brands protected by the corporation’s branding and controlled marketing communications, brands could be built up or obliterated at warp speed as a result of very public community opinion expressed through social media networks. While being a massive opportunity for banks, to-date very few have monetized social media because it is in conflict with the long-held philosophy that “if we want customers to have an opinion about our bank, we’ll give it to them”. That horse has already bolted. The second phase is occurring right now. The emergence of the smart device such as the iPhone and Google Android enabled phones, is a driver for portable or mobile banking. While many banks may argue about security and the limitations of the screen or device itself, the fact is we heard exactly the same arguments about internet banking from those resistant to change within the bank. Already many banks are deploying what amounts to a cashless ATM on a mobile application platform – yes, you can do everything on a mobile phone you can do on an ATM except withdraw or deposit cash. Now, I can hear the proponents of cash already saying that cash will never die and that such an evolution in customer experience will just add to the complexity. To some extent I agree. However, the key to this is not whether cash will survive, but to what extent it will survive. If the majority of micropayments are all done via an electronic wallet or debit card based on a mobile device (or separate for that matter) and if larger transactions are all done electronically through internet banking or through mobile banking – what’s left? In the UK 43 per cent of payments are done by Debit Card, and 23 per cent by Credit Card. Cash still makes up 32 per cent of payments, but as a percentage of the whole, it continues to reduce. Cheques make up just over 2 per cent of payments these days, so it is not hard to see these disappear entirely. If the growth of Debit card transactions accelerates further (not hard to imagine if contactless payment capability is built into your mobile) and other mobile payments like person-to-person (P2P) are enabled on your phone, this will further reduce legacy payment methods. It is not unimaginable to see a split of 85 per cent of UK payments done by mobile/card, and 15 per cent by cash in the next five years. In markets such as Japan, Korea, and Hong Kong the requirement for cash may be even less compared with mobile payments. There are the great unbanked who don’t yet have a bank account who currently rely heavily on cash, but as we will see with M-PESA and G-Money (Chapter 6) this is hardly a hurdle for mobile cash and payments. Success of the Octopus card in Hong Kong, T-Money in Korea and other such locations already proves the concept. We are only talking about the need for ubiquity to make it mainstream. What would quickly kill cash is a technical standard for mobile money that could be widely adopted globally by network operators and device manufacturers. Just like internet and mobile device disruption, this are not the inane ramblings of a technovangelist – this is an inevitable conclusion based on technologies already in place that are on their way to becoming the dominant channel of choice or mechanism of engagement. The behavioural adaption of consumers to the Internet and smart devices already indicates that this will likely take hold within the next three to five years. Adoption rates are speeding up. Technology innovation is speeding up. Customers are adapting to these new changes quicker and quicker. 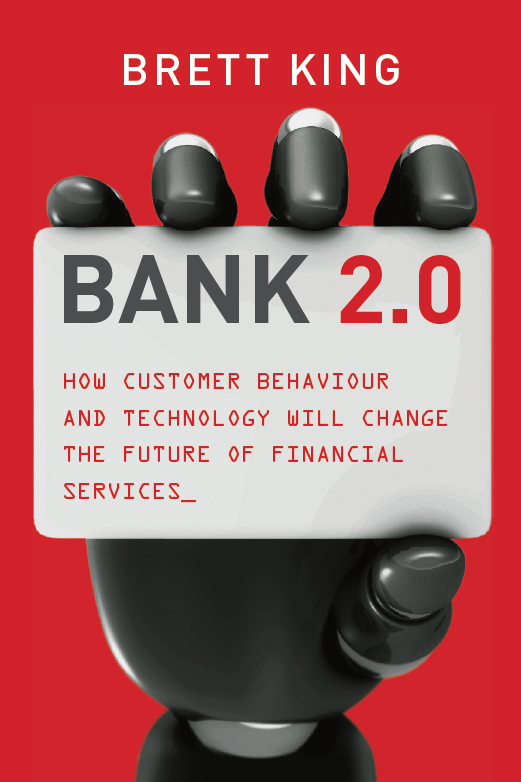 Banks need to too. Let’s just say by the time Phase Three hits – if the retail banks have not adapted, they will be clinically dead. Banks can either own the transaction and payment platform, integrate the technology, OR protest with their last dying gasp of breath that things are not really going to change. “The Branch is Back”, “Cash is King”, “Cheques will bounce back” – yeah, ok. You just keep telling yourself that and see how that works out for you.